The Smithsonian National Air and Space Museum opened a companion facility, the Steven F. Udvar-Hazy Center in 2003, on the property of Washington Dulles International Airport in Chantilly, Virginia. 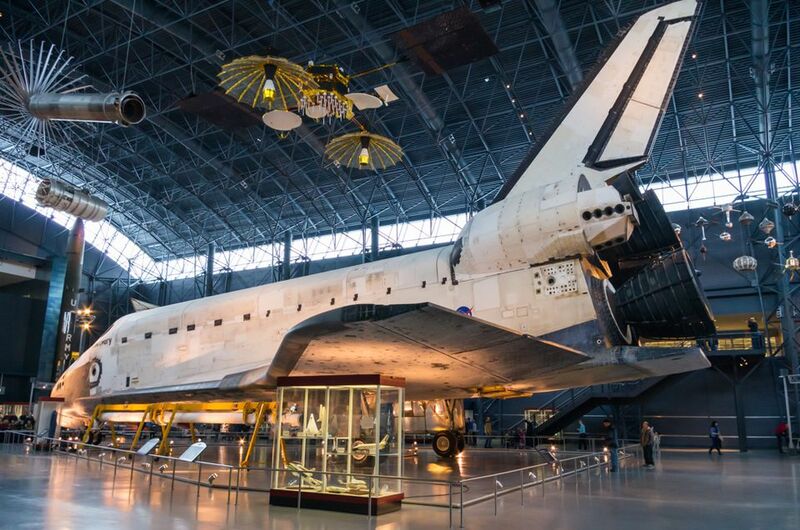 The museum provides a second location, about half an hour's drive from Washington, DC, to display the massive space shuttle Discovery, the Lockheed SR-71 and numerous aircraft, spacecraft and other artifacts that the Smithsonian's National Mall location is unable to accommodate. The Steven F. Udvar-Hazy Center provides dramatic views of an aerobatic airplane hot-dogging upside down, World War II fighters angling for a victory or numerous engines, rockets, satellites, gliders, helicopters, airliners, ultra-lights and experimental flying machines. Watch air traffic leaving from and arriving to Washington Dulles International Airport from the 164-foot Donald D. Engen Observation Tower. The tower displays air traffic control equipment that replicates those used in an operating airport control tower. The Steven F. Udvar-Hazy Center is an educational institution designed to captivate people of all ages. Doors are open 10 a. m. to 5:30 p.m. seven days a week. Admission is free, however public parking is $15. Free parking is available for cars arriving after 4 p.m. The center has an IMAX theater and offers flight simulator rides for a fee. There is a cafeteria and a museum store. There is no direct Metro service to the Udvar-Hazy Center. You may take a combination of MetroRail and/or MetroBus to reach Dulles International Airport or Dulles Town Center where you can transfer to a Virginia Regional Transit bus going directly to the facility. The museum hosts many great events including lectures, family days, demonstrations, gallery talks, story times and more. Check the schedule and plan your visit accordingly. Arrive early in the day as the exhibits will be less crowded or arrive after 4 p.m. to park for free. Purchase Imax, Planetarium or simulator ride tickets in advance to save time. Bring a camera and enjoy some great photo-ops. Aerobatic Flight—The station features aircraft used for precision maneuvers for competitions and air show performances. Highlights include the Pitts Special S-1C Little Stinker, the Monocoupe 110 Special Little Butch and Loudenslager Laser 200 Beautiful Obsession. Business Aviation—Business aircrafts are used by companies to increase traveling flexibility and decrease time spent in airports. This exhibition features a Lear Jet 23 and the Grumman G-21 Goose. Cold War Aviation—This station features aircraft used for aerial reconnaissance. Planes on display include Lockheed SR-71 Blackbird, the Bell H-13J and the Lockheed T-33A Shooting Star. Commercial Aviation—This station features the evolution of commercial aviation from the start of the 20th century to today and includes the Concorde, the first supersonic airliner from Air France, and the Boeing 367-80 Stratoliner. General Aviation—This station features aircraft from general aviation— planes not flown by commercial carriers or the military. Highlights include the Piper J-3 Cub, the Grumman G-22 Gulfhawk II and the Arrow Sport A2-60. Interwar Military Aviation—Many one-of-a-kind and sole-surviving aircrafts developed between the first and second World Wars are on display. The evolution of this type of aircraft can be seen through the Boeing P-26A Peashooter, Loening OA-1A San Francisco and the Curtis F9C-2 Sparrowhawk. Korea and Vietnam Aviation—Highlights include the McDonnell F-4S Phantom, the Grumman A-6E Intruder, the North American F-86A Sabre, the Mikoyan-Gurevich MiG-15 and the Bell UH-1H Iroquois Smokey III. Modern Military Aviation—This station explores the evolution of aviation technology and the nature of air warfare. It highlights the Lockheed Martin X-35B Joint Strike Fighter. Pre-1920 Aviation—This station highlights the transformation of the aircraft from an exciting new invention to a machine of practical utility and features some early designs: the Caudron G.4, the Langley Aerodome A, the Nieuport 28C 1 and the SPAD XVI. Sport Aviation—Sport Aviation refers to any non-commercial, non-business and non-military flight. These aircraft are often homebuilt and can come in the form of hang gliders, fly gliders, sailplanes and others that date to the earliest days of aviation. Highlights in this station include the Grob 102 Standard Astir III, the Monnett Moni, the Bowlus du Pont I-S-2100 Senior Albatross Falcon and the Arlington Sisu 1A. Ultralight Aircraft—Ultralight aircrafts gained popularity after 1975, when John K. Moody demonstrated their ability to take off with running takeoffs and landings on level ground. This station features the Cosmos Phase II Ultralight, the Ultraflight Lazair SS EC and the American Aerolights Double Eagle. Vertical Flight—This station explores the evolution of rotary-wing aircraft and their invaluable, essential role in the military. Highlights include the Bell XV-15 TRRA (Tilt Rotor Research Aircraft), the Bell 47B and the Autogiro Company of America AC-35. World War II Aviation—This station follows the evolution of aircraft used in World War II as demands on technology and efficiency increased. Featured aircraft include the Boeing B-29 Enola Gay, the aircraft that dropped the atomic bomb in Hiroshima, and the Lockheed P-38J-10-LO Lightning. World War II German Aviation—This station explores the rise and fall of German aviation in World War II. Highlights include the Arado Ar 234 B Blitz (Lightning), the Dornier Do 335A-1 Pfeil (Arrow) and the Focke-Wulf Fw 190-F. Applications Satellites—This station explores how satellites have evolved to fit both national security and civilian needs. It highlights the Corona Film Return Capsule, the Tracking and Data Relay Satellite, the Relay 1 Communications Satellite, the Agena-B Upper stage and the Sirius FM-4 Broadcasting Satellite. Human Spaceflight—This station highlights the evolution of humans in spacecraft. Highlights include the Space Shuttle Discovery, the Manned Maneuvering Unit, the Mercury Capsule 15B Freedom 7 11 and the Mobile Quarantine Facility. Rockets and Missiles—Rockets and missiles transformed in the 1900s to launch human explorers, satellites, telescopes and robotic spacecrafts into space. Some highlights include the Redstone Missile, the Loon Missile, the Goddard 1935 A-Series Rocket and the Henschel Hs 293. Space Science—This station showcases vehicles that traveled in Earth’s upper atmosphere or beyond. Highlights from the collection include the Mars Pathfinder Lander and Sojourner Rover, the Spartan 201 Satellite and the Vega Solar System Probe Bus and Landing Apparatus. The National Air and Space Museum is one of the world's most popular museums with more than 8 million visitors each year. The museum maintains the world's largest collection of historic aircraft and spacecraft and is a center for historical research on related science and technology.